cdcindonesia.com - The morning enthusiasm of all friends, the following is information about job vacancies coming from one of the banking companies in the banking sector, namely:PT Bank CIMB Niaga Tbk - CIMB Niaga or is a well-established privately-owned commercial bank in Indonesia. The Bank was first established in 1955 and initially registered as Bank Niaga. The name of PT Bank CIMB Niaga Tbk officially launched in 2008. PT Bank CIMB Niaga Tbk is a local subsidiary company of Malaysia-based investment bank CIMB Group Holdings Berhad (CIMB Group). At present, CIMB Group is the majority shareholder at PT Bank CIMB Niaga Tbk, with 92.5% of ownership. The rest is owned by general public (7.5%). 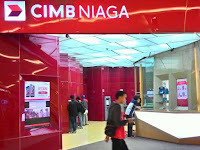 Headquartered in Jakarta, CIMB Niaga supported by 542 branches, 4,500 ATMs, 174 Multi-Function Devices/MFD, 683 Cash Deposit & Recycle Machines, and 12,782 employees spread in all over Indonesia. Bachelor degree (S1) in any major with GPA ≥ 3.00. Previous working experience on Operations Unit preferable maximum 1 year. Demonstrate the following qualities: integrity, high motivation, self-confidence, driven / energetic, good communication / interpersonal skills, professionalism. Bachelor degree (S1), preferable majoring in Systems / Technical Informatics with GPA ≥ 3.00. Previous working experience on IT Unit preferable maximum 1 year. Fluent in English, both oral and written with minimum IELTS score 6.0 or TOEFL score 500 (within 6 months). All applications are appreciated and will be treated confidentially.Only shortlisted candidate will be proceed on the next step.